Special Instructions The family will receive friends one hour prior to the service. 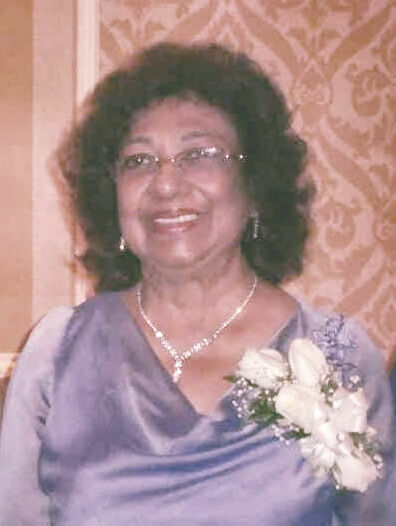 PERSAUD, Eunice Drupatty, 73, of Henrico County passed away Thursday, April 4, 2019. She was born on March 20, 1946 and was the eldest daughter of Dan and Claris Mohan. She fought the good fight; however, after a lengthy illness she passed away with her family surrounding her. She leaves behind her loving daughter, Selene Tyrrell and son in law Jeffrey; and her beloved son, Trevor; father of her children, Rajendra Persaud; her granddaughters, Damiya Persaud Samantha Tyrrell and Morgan Persaud; her longtime partner Raymond who was always there for her, eight brothers and sisters, Kenneth (Seeta), Bernice, Allan (Bemal), Marten (Pauline), Janice (Rohan), Dennis (Chitra), Sherri (Ricky) and Terry; nieces and nephews; as well as, great-nephews and great-nieces. Also numerous cousins. We want to thank the staff at Henrico Doctors Hospital and at the dialysis center. The family will receive friends from 6 to 8 p.m. Thursday, April 11, and from 1 to 2 p.m. Friday, April 12 at Affinity Funeral Service, 2720 Enterprise Pkwy, Richmond, VA 23294. A funeral service will follow at 2 p.m. Friday at the funeral home. We are truly sorry for your loss. Our deepest condolence to the family and may she rest in peace, and may god continue to wrap his arms around all of you in this time of grief. Selene…My sincere condolence to you and your family for your loss. My thoughts are with you during this difficult time. Our thoughts and prayers for you all especially for Naddy and Trevor.Fond memories from Guyana to Flatbush to Virginia where I visited her and more recently our conversations while I was driving home from work..she would say she is ready to go and did not want to suffer.She was so Proud of her Children and Grandchildren.She will be missed and remembered for how she kept her home and like she will say “I like nice things” and not forgetting what a Great Cook she was. Love to you all. May God Bless and Give Comfort to each of You. Selene, I was saddened to hear about the passing of your mother. My thoughts are with you and your family. My deepest sympathies Selene on your mother’s passing. I wish you and your family peace and comfort in the coming days and beyond. Our deepest condolences to the bereaved family. We pray that God will grant you the strength. … Your loved-one will be missed and she will never be forgotten, may her soul rest in peace. May God put her in a special place where she will be watching us, the people who loved and cherished her! Sincere condolences from the P.S. 41 family. Our prayers are with you. Praying for peaceful memories to comfort you and your family Trevor. May the Divine bless you.. give peace and strength as you comfort each other. Our condolences to Raymond, Selene, Trevor, the grandkids, sisters, brothers and entire families. Our thoughts and prayers are with you during this difficult time. Sherri, my sincere sympathies and condolences to you and your entire family.